House Minority Leader Nancy Pelosi of California smiles as she is cheered by a crowd of Democratic supporters during an election night returns event at the Hyatt Regency Hotel, on Tuesday. US: US President Donald Trump urged Democrats on Wednesday to “put partisanship aside” as he bluntly warned them against using their newfound control of the US House of Representatives to tie up his administration in investigations. Trump offered an olive branch to Democrats, praising their leader and likely next House Speaker Nancy Pelosi and saying “I really believe that we have the chance to get along really well with the Democrats.” “It is time for members of both parties to join together, put partisanship aside, and keep the American economic miracle going strong.” Trump cited health care and infrastructure as areas where the two parties could work together. Trump reeled off a shopping list of disadvantages he claimed that the Republicans had faced going into Tuesday’s vote, including “wealthy donors and special interests” for the Democrats, and “very hostile media coverage.”Republicans backed by the White House defeated Democratic senators in several states won by Trump in 2016 -- Florida, Indiana, Missouri and North Dakota. Democrats gained seven governorships but fell short in a high-profile race in Florida, which -- as Trump noted on Wednesday -- is expected to play a key role in the 2020 presidential election. 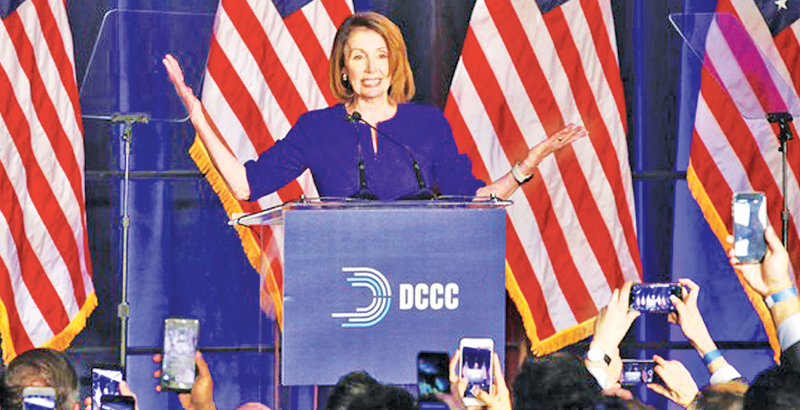 Pelosi, who is likely to return as House speaker despite opposition from some centrist Democrats, promised that the party will serve as a counterweight -- but also work with Trump.